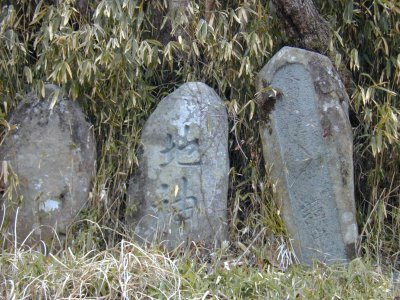 In Japan, a variety of deities are known, usually peacefully side by side, starting with ancient animistic believes of "Gods of Mountains, Waterfalls, Rocks" and so on, leading to the concept of KAMI in Shintoism and later the influence of Buddhism with its manyfold HOTOKE. Was God the real creator? To distinguish the Christian God, with a capital letter, from the other gods of other religions, we can use the capital G ! In German, we can distinguish between Gott and Gottheiten, deities. the face of the deity ?? To complicate matters, many Buddhist deities have their Japanese counterpart, or vice versa. Even now, many traditional homes have a special shelf for the kami (kamidana　神棚) and an alcove for Buddhist souls of the ancestors (butsudan　仏壇). Weddings often take place at a Christian church, although the participants are not Christian believers at all, but they love the ceremony that goes with it. Hotoke　仏，佛 does not only refer to a Buddhist deity, but also to the dead body of a person. This whole Saijiki is devoted to the many ceremonies and festivals around these various deities. Waterfalls and Fudo Myo-o 不動滝 worshipped as the deity himself, a Buddhist Deity in an animistic setting, Fudo Myo-O is a borderline case, where the mountain asceticism has developed its own view of the divine. Haniyasu and his female counterpart were produced from Izanami's feces. the Gods are absent (kami no rusu). The Road to Izumo, where the Deities meet. Mark as a great photo dictionary on these deities, so check it out. 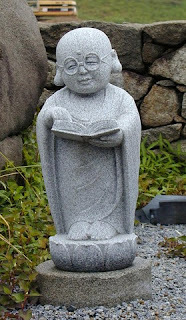 I have referred to a few here on my own pages of Japanese deities, so please look at my index HERE ! Enma Ten, Enma Oo (Emma): The King of Hell閻魔天、閻魔王 has also been the subject of haiku. Discussion about the translation as "Saint Jizo" in the haiku of Issa. She resides in a grove with peaches which blossom only every thousand years. If you eat one, you will get eternal life. He stole three peaches ! He is depicted as an old man, holding a peach in his hands. And he smiles in eternal life. When he belwe on his pumpkin, a horse came out to transport him to any place. He is always depicted with his pumpkin and the horse lurking out of it. Immortals who live in the mountains, ride the clouds and drink the dew. There are more than 500 known. There are also some female mountain hermits. The arrangement of contents in the online Encyclopedia of Shinto (EOS) follows the general topical organization of the original Shintō jiten. Research on Shinto and Japanese Culture. "Yaoyorozu no kami (八百万の神, eight-million deities)—in Japanese the number "eight-million" is often used to imply infinity. "It is impossible to understand Japanese poetry without knowing something of the Buddhist and Shinto culture from which it springs. Shinto's ethos of omnipresent, indwelling spirits underlies every natural image. The 'kami', or gods, of Shinto belief inhabit not only the mountain passes of the actual countryside but also those of the poems-- each bent pine tree, seaweed-filled bay, even wind, is charged with an abiding and informing presence of its own. Japan's earliest literary works, mythological accounts of the country's origins that link the imperial family to the age of the gods, are almost purely Shinto in feeling. But by the eighth century, Japanese poetry had become soaked through with a deeply Buddhist sensibility as well." "Hirai is a Shinto priest who studied the history of religions at Chicago with Joachim Wach. One day he took us to see a famous temple at Ise. 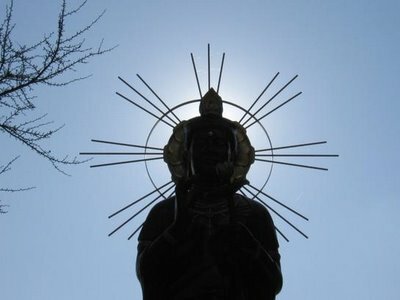 Someone in our group, an American philosopher, told him: I see the temples, I attend the ceremonials, the dances, I admire the costumes and the courtesy of the priests -- but I don't see any theology implied by Shintoism. "We have no theology. We dance." Yosari is an old word that denotes evening time; Kogo dai jiten (Shogakukan 1983) 1707. "cool air--/ at the gate, too, an evening/ of Buddha in the world." © Gabi Greve, February 2006 Look at more here !